Mother SquarePants – From SpongePedia, the biggest SpongeBob-wiki in the world! Margaret Squarepants is SpongeBob's mother seen in a few episodes. Margaret Squarepants has a darker yellow circular face. Like Harold Squarepants, she appears to be a "natural" sponge. Her outfit (pearls, pillbox hat, cardigan and matching dress) resemble that worn by famous first lady Jackie Kennedy, as do her black, curly hair and carefully-done make-up. 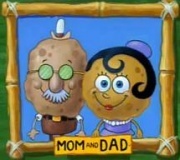 Mother SquarePants is married to Father SquarePants and they live together in their average house. Their first appearance was in the episode Home Sweet Pineapple. In the episode Mother and Father SquarePants had to take SpongeBob and Gary home because SpongeBob's House got destroyed. They arrive in the boat but the Pineapple home restored to its original appearance and they went back home. Her full name is Margaret SquarePants. In the episode: No Free Rides, she, Father SquarePants and SpongeBob surprised Mrs. Puff. They bought SpongeBob a boat and took SpongeBob home. Therefore, she and Father SquarePants are good parents. It was revealed in the episode Home Sweet Pineapple that SpongeBob and Gary both lived in Mother and Father SquarePants' home for a long time. She also made an appearance in the episode Culture Shock. In the episode New Digs, she and Father SquarePants came to the Krusty Krab (while it was SpongeBob's home) to stay for a while. She was seen taking a shower but was disturbed by Mr. Krabs. In the episode Mermaid Man and Barnacle Boy IV she was trapped in the jar due to SpongeBob's carelessness of using Mermaid Man's Belt. Also, she appeared in a photo of Sing a Song of Patrick. However, she does not like I Wrote This, the song Patrick had written to Big Shot Records, and she flipped the picture backwards to not hear the song. In the movie Truth or Square, in a flashback, she is seen pregnant with SpongeBob at the Krusty Krab and give's him his first patty, which explains why SpongeBob loves Krabby Patties, wants to work there, why he made his first patty and all the stuff explained in Help Wanted. In A SquarePants Family Vacation her named was revealed to be Margret. In Whelk Attack her maiden name is Bubblebottom. This page was last modified on 24 April 2018, at 20:06. This page has been accessed 48,447 times.